We are very lucky that Ren's dad has kindly offered to put us up before our early morning departure for the Ferry. Ren would also like to see his uncle who is visiting Ren's dad the same day as we are planning to arrive. It will be an afternoon visit so we need to be at Ren's dad's by early afternoon, which means I need to be up at 4:30am to be ready for a 6am start. I go to bed early but I am too excited and nervous to sleep properly. I worry about riding onto the ferry and about actually riding in Spain. 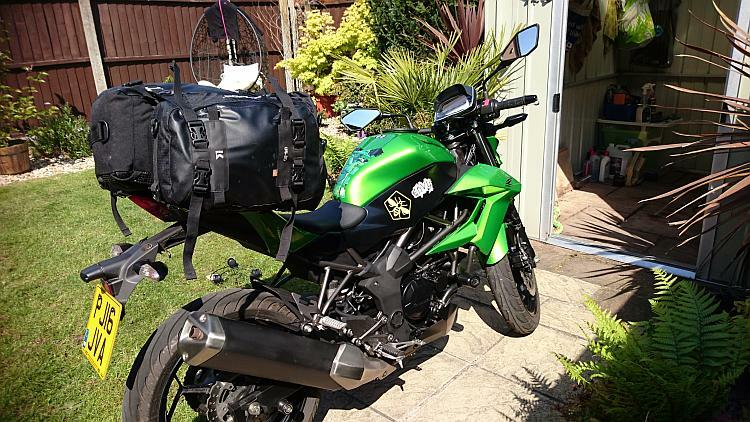 It is all very new to me and this will only be my second trip abroad riding my own bike and the first time on a ferry and abroad for the little Kawasaki Z250SL. We set off successfully on time and despite my hatred of early mornings I have to admit it is lovely riding this early in the morning with such light traffic and the sun is out. The first leg is an easy 2 hour's riding. I feel I could have carried on longer but we had to stop for petrol. Then another stop at Rykas Cafe by 11am and we reach Ren's dads for 1pm. That was a pretty perfect 256 miles of riding. The 7 hour trip felt really comfortable. It all felt a bit weird but is has been good to have travelled all that way and still it is only early afternoon. I may have discovered at the grand age of 48 I like early mornings. Would you believe it. Shocker!! Motorways are boring but at times when you need to simply get from point A to point B they serve a good purpose. The Kawasaki Z250SL was happy humming along at motorway speeds. I however had to be careful of not allowing any guilty feeling for going away at this time to creep in because motorways can give you way too much thinking time. I have already learned on previous trips that carrying excess mental baggage while travelling is counter productive. It only weighs me down and does nothing to lessen the load of those who are suffering. I know this, I know this. I just need to keep repeating it because it is not easy for me not to carry guilt on my pillion seat. I am so busy trying to make other people's lives better I sometimes neglect my own. I find the balance between caring for oneself and others hard. It is rather like trying to balance a ball, it's not always possible and it certainly isn't easy. Talking of balance, the only other problem I have with motorways is remembering I have legs and hands and gears and brakes when coming to a service station or leaving the motorway. After sitting for hours not operating these controls they can feel alien when finally needed again. The following day is a rest day and a chance for Ren and I to spend time with his family. Later in the afternoon Ren is busy adding his beloved wooden modifications to his bike so I ponder my own luggage arrangements. I carry out some slight rearrangement of my packing so I can gain easy access to my ferry cabin supplies. 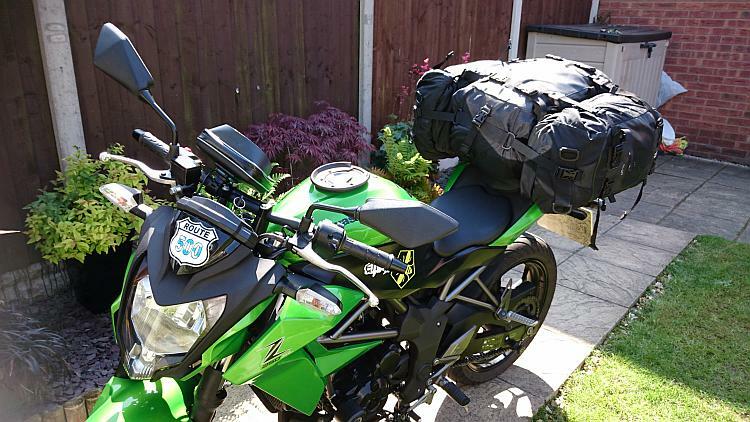 I put any stuff needed for the cabin in one small bag and put that bag at the end of one of the side Kriega bags so once on the ferry I can grab it quickly and easily. Well that's my plan anyhow. Kriega - what's not to love? Waterproof, smart and compact. I love my Kriega luggage. Ren does not, he hates that it takes more than 2 seconds to strap them down. However I don't like the slight wobble they have. 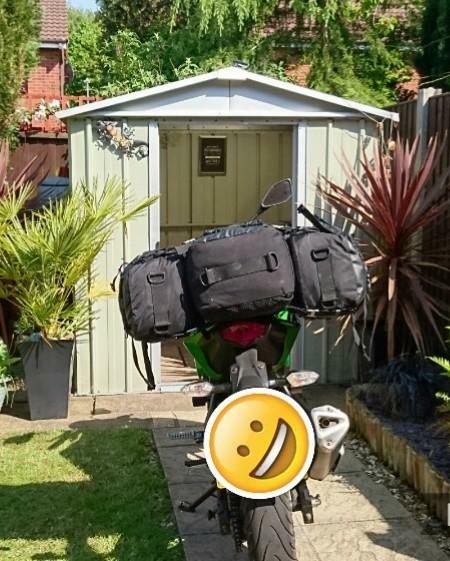 This is probably down to the very narrow and angled excuse for a pillion seat on my bike not giving the bags a nice solid base to sit upon. It has never been a problem on any of my trips I just like luggage to be solid with no movement. I help myself to Ren's spare bungee and by hooking that around the bike and onto the loops on the luggage I find I can finally achieve greater stability. So that's the bike all sorted...tomorrow we ride. That blasted luggage! It is very well made and it's a good system but oh my goodness it drives me to despair. Every time she needs something from it there's a 7 minute hiatus as she tightens, fastens, clips, pulls and re-re-re-adjusts every blooming buckle. Gerra box and lob stuff in it, job done! Sharon, I am sure if you ask Ren nicely, that he could secure the luggage better with a few wooden brackets!! I have offered Rod I really have. She has this "thing" about the bike looking nice though. I don't gerrit meself. There are other solutions, y'know.. Build quality is of course unknown! That all looks very familiar to me. I think in Asia they do a 250 version of the z300. Well Keith m the Z250R was sold here until the bike was updated to the 300. I expect the 250 is kept in production for markets around the globe with different licensing laws. It gets very complicated when looking at the bigger picture. Aaaaw poor Snod! I don't think your shame is sufficient to warrant disemboweling yourself though. I'd suggest a cold shower and having a word with yourself will be enough.